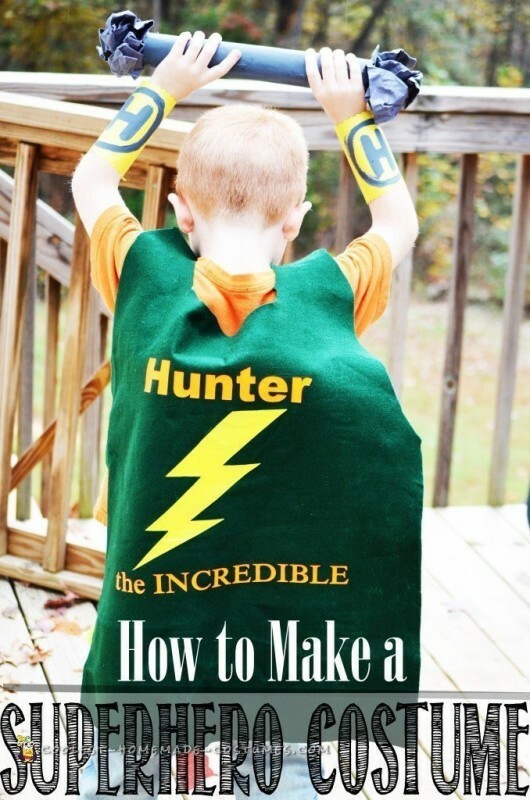 Looking for an AWESOME DIY for Halloween or Superhero Day at school? 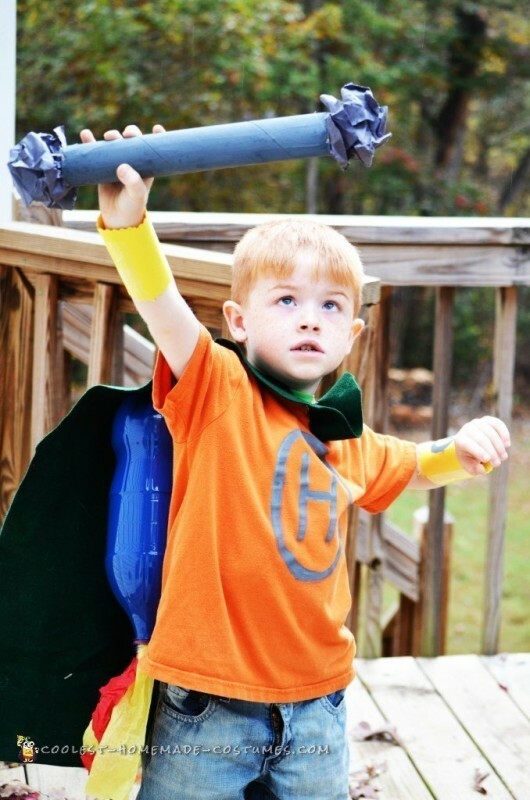 We didn’t have any Halloween costumes for spirit week at our son’s school so we improvised and made him a superhero with his own superhero costume! I first asked him what his super power would be? He answered that he wanted to lift heavy things and fly really fast. So away I went planning. FYI, in these photos my son has a bald spot in his hair. He decided one day that it would be a good idea to play with a pair of scissors! The first thing I did was make a “weight” out of a paper towel holder and wadded up paper. I painted it gray so it looked like real weights. 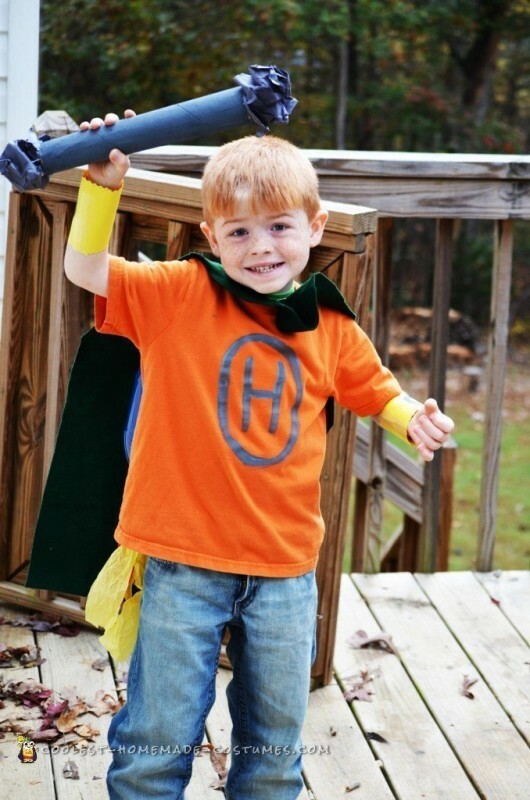 I made the weight cuffs from construction paper and painted an H on them because his name is Hunter. The superhero costume cape was actually a puzzle mat I had and just cut a head area out of it. I used my cutter to personalize the back of it with heat transfer vinyl and named him “Hunter the Incredible”. 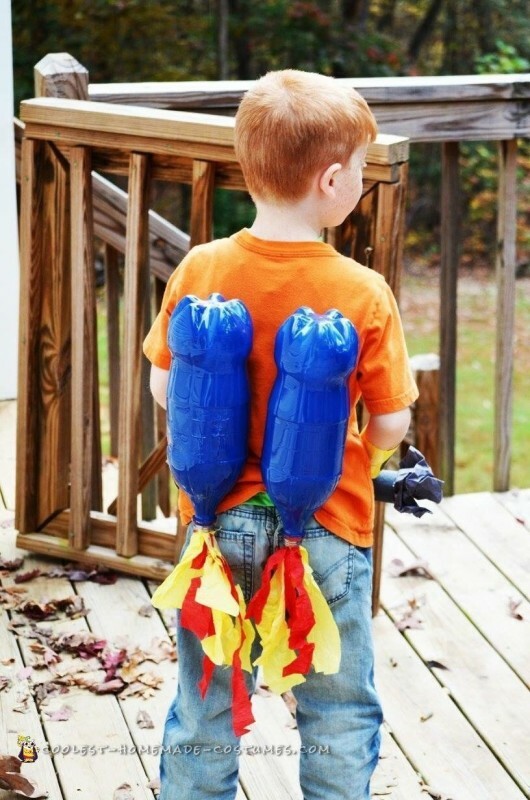 This superhero costume wouldn’t be complete without jet packs!!! I used two coke bottles and spray painted them blue. Actually, I had them left over from his Minion party. I then took some crepe paper and taped the yellow and red to the inside of the coke bottle to look like fire. I hot glued them to an old shirt he had so they would stay on. I just LOVE this costume!! He wore it again this year for character day at school and it was just as big of a hit! Everyone loved it!